He: Will you answer a straight question? He: Will you refuse to answer a straight question? Physicality plays a central role in Uwe Rasch’s artistic works. Aesthetic questions- and with them general questions of composure and, above all, ones about physiological dimensions of sound dimension and the intensity of articulation- can be picked out as central themes and both of these are strands of interest for the Bremen composer. The history of the body is the history of its functionalisation, says Uwe Rasch. Taking the subjectivity of the body seriously means something different and entails: concrete feelings, different experiences of time, correspondence from interior and exterior, (physical) memories, random acts. 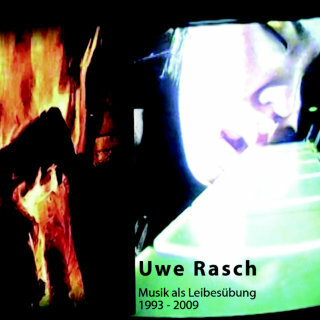 Therefore, for Uwe Rasch, each musical action and the resulting imagery are closely related with the physical (time) dimension. In the flippancy of movement, Uwe Rasch draws an analogy to the flippancy of music, both arts are constitutively connected with the elapsing of time. In his works, Uwe Rasch addresses the problem of communication. It is about experiencing feeling speechless and attempting to overcome such a problem. Underlying this problem is the sensation that traditional expressive models used to depict our contradictory reality are proven to be increasingly inadequate. The composer, by means of contrast, lays down his way of working, which has a strong conceptual feel about it. The design of the scenery relates to his special intention. Ideas and layout of the stage account for further parts of his works. The works resemble experimental designs, the core of which is already visible in the initial configuration. These are occasionally wondrous, paradoxical or fanciful. Yet, for Rasch it is not quite simply about provocation. It could be perhaps said that he would rather follow defensive strategies; in order to allow the absurdities, contradictions and inconsistencies of our reality to be experienced. In each and every case, it is about a state of active observation. For Beckett, it was known as “Mal vu mal dit” (“Ill Seen Ill Said”) and for Adorno: “That which is poorly spoken, has been badly thought”. However, even before the problem arises of whether such a state of active observation does indeed exist, one must, in the first place, find a language, or even, foremost, a voice. Uwe Rasch retreats back to the beginning, to an art, which, with its holistic direction, results in ritual actions. He often demands isolated body movements from the performers, as well as specific overextensions and independent movements. The mechanisation of movement acts as a synonym for alienation and exhaustion, which is expressed in a stereotypical manner. The musical process is thus a gesture, a scene, a theatre, and is thus to be construed as an energetic, three, or rather, multi-dimensional happening in each specific area in which the interface between unconscious and conscious would be affected. That also means the emphasis of the physical presence of the unique, the irretrievable and the creatural as engagement in systematic thinking, and thus to take up, by securing the form of equipment and structures, the exhaustion, the vulnerabilities and the roughness of the flesh-like as a field of work. One must do all of this without a naïve “back-to-nature” view, which is only a mental image itself. In his works, Uwe Rasch likes to allow his movements to work on several levels and in different dimensions. Further meanings- which are often literary references- can be discovered through the observation of subtleties. Different laws and principles correspond to Rasch’s levels. These laws and principles follow the inherent laws of the respective professions (music, film, and dance) because the types of sensory perception also have their own integrity. The composer works with analogy formations and contrasts, media images, and translations, deviations, visualisations, projections and paradoxes which enables the beholder to understand the contexts in a roundabout way. He builds an entire network of meanings through his metaphor-laden artificial language. The audience then become entangled in this network: the symbolism of the images, the literary and theatrical connotations and the ritual emphasis, with which the feats are celebrated, should all cause confusion. Such aspects of the network form respectively their own stage, upon which body language, music and images all amalgamate. Uwe Rasch is interested in hidden knowledge, which becomes visible in the art of movement, as a kind of criterion for such body language, music and images and their respective sedimented veracity. Would a unity of the identity of bodily and subject perception be at all conceivable in a world where coherencies are becoming more and more separated, and in the case of it indeed being conceivable, how would this be at all possible?